Boulder Municipal Airport (KBDU) had an open house today. Not an airshow per se, but there were a couple of cool airplanes parked on the ramp (including a very rare two-seat Supermarine Spitfire trainer) for inspection. I took Hooper to the airport for our very first "father-son" type outing. It was great. 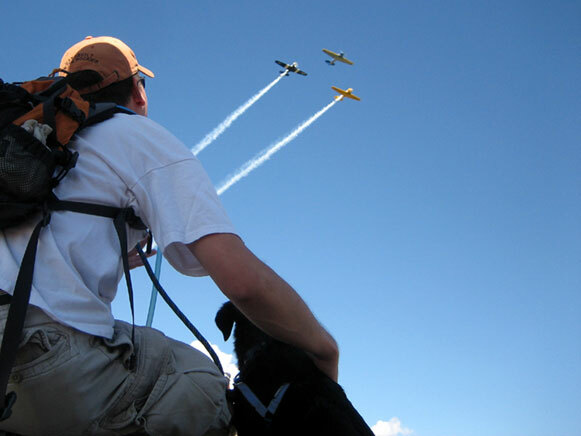 At one point, a flight of three AT-6 "Texan" aircraft flew overhead, and my friend Michael got a shot of Hooper and I enjoying the show. A few moments later, they all landed and taxied up to where we were, and Hoop didn't even flinch. So, he likes airplanes, even the big, loud, radial-engined ones. I was so proud.